Pauline, her daughter Teresa, Maurice, Teresa’s husband and their baby son Luke have all retreated to the English countryside in two adjoining cottages for the summer. Pauline does some editing on a manuscript when she is not watching nature transforms itself through her window. Teresa looks after fifteen month old Luke. Maurice, charming Maurice works on a book on tourism and invites almost every weekends James to help him as well as James’ girlfriend Carol. As summer unfolds however grows in Pauline’s heart a bad presentiment. Why is her troublesome relationship with her ex-husband being so vivid suddenly ? And the pain she went through ? Has it got something to do with Teresa? Penelope Lively’s writing has the fascinating capacity to slow down for us the passing of time. Like an invitation to look at things more closely, be it the ripping of the wheat in July, the smile or its very absence on a cherished face, the unfolding of love and its disarray. What is love anyway? We journey through that very hot summer, wary that things might not be as they look like. Until an unforeseen end. 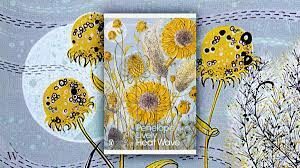 I enjoyed reading Heatwave, it opened my eyes to looking around more, to slowing down, and pulled out of me that contemplation nature that I (we?) tend to neglect in the speed of day to day life.